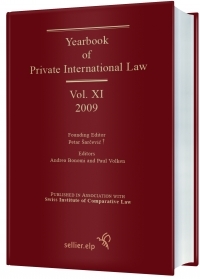 The XI volume (2009) of the Yearbook of Private International Law (YPIL), published by Sellier – European Law Publishers in association with the Swiss Institute of Comparative Law (ISDC), is out. The Yearbook, edited by Andrea Bonomi and Paul Volken, contains a huge number of articles, national reports, commentaries on court decisions and other materials, up to nearly 650 pages. Juan José Alvarez Rubio, Contracts for the International Carriage of Goods: Jurisdiction and Arbitration under the New UNCITRAL Convention 2008. Fang Xiao, Law Applicable to Arbitration Clauses in China: Comments on the Chinese People’s Supreme Court’s Decision in the Hengji Company Case. Andreas Fötschl, The Common Optional Matrimonial Property Regime of Germany and France – Epoch-Making in the Unification of Law. Jenny Clift, International Insolvency Law: the UNCITRAL Experience with Harmonisation and Modernisation Techniques. Gilberto Boutin, Forum non conveniens and Lis alibi pendens in International Litigation in Panama. Benedetta Ubertazzi, Intellectual Property and State Immunity from Jurisdiction in the New York Convention of 2004. See also our previous posts on the 2006, 2007 and 2008 volumes of the YPIL.